The training includes hands-on experience using a BPMN tool. 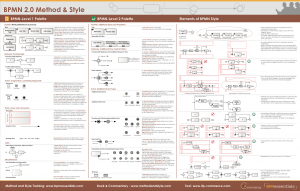 Versions of the training are now offered on three different tools, all of which support validation of style rules as described in BPMN Method and Style. Vizi Modeler (BPMN Tool) for Visio from itp commerce has been used with the training since 2007 and introduced native style rule validation in 2011 and Method & Style Validation in 2013. A 60-day license to the tool is included with the training, and students may upgrade to a permanent license at a substantial discount if purchased through BPMessentials. A add-in to Microsoft Visio 2007, 2010, or 2013 (any edition), the most widely used tool for process modeling, Process Modeler for Visio provides complete support for the BPMN 2.0 palette and XML, import of externally defined models, and – most important for BPMessentials – built-in Method and Style validation. Signavio provides a SaaS-based Process Editor and team repository hosted in the cloud that offers a zero-footprint alternative for BPMN modeling. Signavio now provides built-in style rule validation, important for BPMessentials training and certification. Use of the tool is free for 60 days to students in the training. Contact Signavio for further information about the tool.